I am a 24 year-old college graduate and I have a bachelor of science degree in zoology. 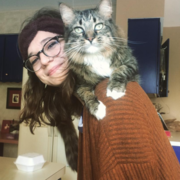 I have have a cat of my own and have worked at a pet store in the past and shadowed multiple veterinarians as well as volunteered at humane societies. Currently, I work in the field of wildlife ecology. I am looking for some extra income on the side doing something I love, which is caring for animals. I am comfortable with dog walking, feeding, playing, cleaning litter boxes, giving meds, and anything else you may need. I have experience taking care of cats, dogs, and small mammal friends such as mice, rats, and gerbils, although I am comfortable caring for any pet with some instruction. My prices for overnight care are negotiable, especially for multiple nights.